For over 40 years and counting, Minuteman Press has developed and refined its customer service driven business model. We are the world's largest design, printing and marketing franchise, providing a full suite of essential products and innovative branding solutions that help other businesses grow. The key to our success is our unique system combined with the ongoing local support we provide to our owners. Learn how you too can reach your goals while helping businesses achieve theirs! Today, we are the modern version of the printing industry, providing high quality products and services for businesses that go way beyond just ink on paper. Our design, print and marketing centers offer custom marketing and branding solutions that are tailored to meet the needs of today's business professionals. Anything you can put a name, image, or logo on, we can produce. This includes promotional products, custom branded apparel, direct mail advertising, large format printing (banners and posters), signs, and much more including traditional printing and design. Think about a brand new business just starting up, a business planning to grow and retain customers. They all need a full marketing and brand awareness campaign to get noticed. Minuteman Press has the programs that deliver results to ensure repeat business from clients. 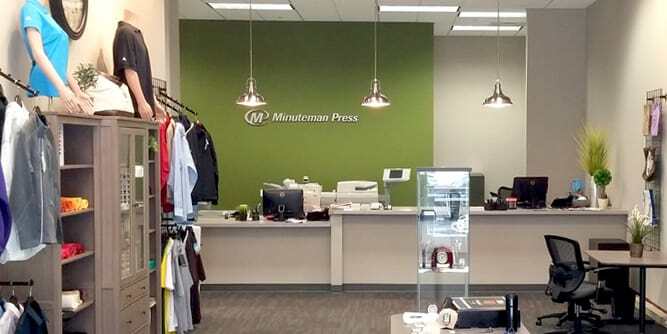 Prior experience is not necessary to own and operate a Minuteman Press franchise. Our owners are business people who are alert to the needs of their local business community and can enjoy a long-term repeat relationship with their clients by providing outstanding quality and service. Here is why we're head and shoulders above any franchise in the B2B services industry! Please fill out the from below to learn more about Minuteman Press and take a no obligation look at this exciting opportunity.